NB: A vehicle access permit is required from Queensland Parks and Wildlife. DO NOT drive in saltwater – observe low tide windows for beach access (eastern beaches are trafficable 2.5 hours before and after low tide only. Maximum beach driving speed limit is 80kms per hour. Watch our for freshwater creeks and approach with caution. Park vehicle above high tide mark, facing downhill (avoiding oncoming traffic and ensuring safety of vehicle against incoming tide). With the exception of specific one-way tracks between Eurong and Central Station all other tracks are dual thoroughfare allowing two-way oncoming traffic. Use side-bays situated along tracks to give way. Observe inland speed limits and only use established tracks sounding horn when turning blind corners. DO NOT engage high range or low range 4×4 on a sealed surface (that is, ensure 2×2 is engaged when driving on a sealed surface, including accessing the barge (ferry) and driving through Eurong Beach Resort). Ensure adequate distance is maintained between your vehicle and other vehicles, for example 50 metres, allowing time to avoid potential issues another driver may be about to encounter. Only a 45 minute drive east of Gympie on Queensland’s Cooloola coast, Rainbow Beach offers a huge range of activities and accommodation options. Boutique shops, fine dining and activities such as para-gliding, sky-diving, shark diving, dolphin kayaking, four wheel driving, surfing, swimming, fishing and bush walking should keep the avid visitor completely satisfied. The beach atmosphere is casual whether camping (both public or private caravan parks available) or staying in 5 star luxury resorts. Often described as one of the most beautiful beaches in Australia (it hits the Top Ten list on a regular basis) Rainbow Beach is considered the jewel in the crown featured in what is known as the ‘great beach drive’. 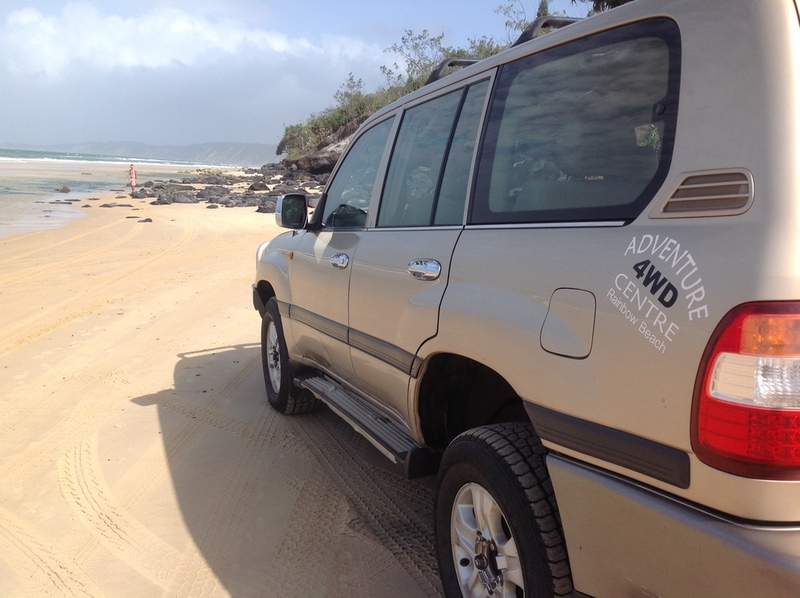 Connecting to 4×4 beach access scenic drives along Teewah Beach and Noosa North Shore it makes for one of Australia’s most popular off road experiences. A definite highlight are the panoramic views on offer from Carlo Sand Blow which is a 15 minute walk from the top of Cooloola Drive in Rainbow Beach. It is one of the Top Ten para-gliding spots in Australia and once up there you will understand why. You’ll also see 4WD vehicles driving on the beach below the coloured sand cliffs which is a gazetted road and connects to Leisha Track and over to the Teewah Beach heading to Noosa. The 4×4 beach drive from Rainbow Beach to Noosa takes approximately 45 minutes. 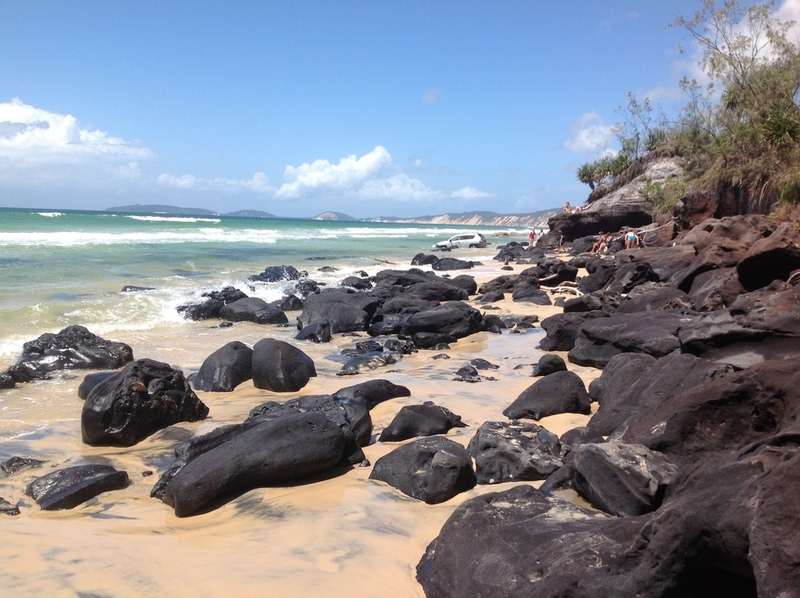 A popular public beach camping spot in Rainbow Beach is Inskip Point. Situated only metres from the Barge point taking 4×4 vehicles over to Fraser Island, Inskip Point is the ideal fishing and exploration destination and offers safe swimming conditions at Pelican Bay. The easiest, quickest, fastest and cheapest way to get to Fraser Island is via Rainbow Beach (known as the ‘gateway’ to Fraser Island). The Barge runs daily and on demand, no timetable, however, it pays to check tides as best access to and from Fraser Island via Inskip Point is during the low tide. The low tide beach window, which provides the beach ON and Off times, is generally determined by calculating 2-3 hours either side of the day’s lowest tide time. Sometimes referred to as “Rainbow Beach’s best free entertainment” Mudlo Rocks positioned just before the beach access ramp into town can make for a very negative experience when dueling with mother nature’s beach hazards. Mudlo Rocks at Rainbow Beach can be selective in granting passage – observe beach conditions and low tidal window. While the same driving tips apply for local beach driving enthusiasts Mudlo Rocks can pose an entirely different accessibility scenario. During TCMarcia early 2015 the rocks were severely exposed rendering beach passage impossible for a number of weeks, even at dead low. The alternative is just a matter of using the Freshwater Road (a sand track off Teewah Beach that leads back into Rainbow Beach township). Disaster strikes when people tempt fate during unsuitable tides and beach conditions due to the town access track lying just beyond the rocks. Submerged soft pot holes and coffee rock clusters lie in wait for the next unwitting victim. Furthermore saltwater will start corroding every part of hot moving componentary it has been exposed to ON CONTACT. Rinsing the saltwater off is a ridiculous concept. Once an alternator is exposed to a splash of saltwater the lifespan is shortened extensively. Same goes for the wheel bearings, rotors and starter motor – they will be the first to go. Beach driving is a lot of fun but lack of respect is costly. This facebook page is widely followed by ‘rockers’ who love visiting this area and frequently seek information and also impart their own pictures and updates. 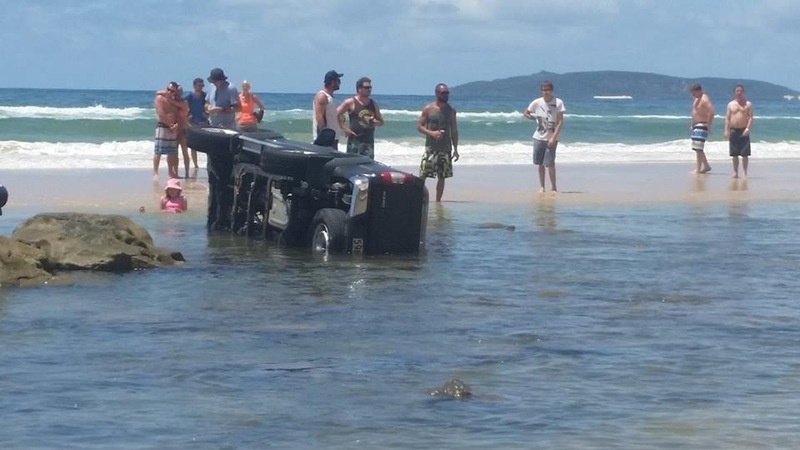 It is a community page that has virtually come into its own due to the popularity of beach driving locally and on Fraser Island – focusing particularly on conditions around Mudlo Rocks. Becoming a “stucker” is not a title worn with pride – being a stuck sucker is rather self explanatory. Taking the risk (driving outside the low tidal window) just wasn’t worth it. An upturned vehicle on the beach makes for considerable deliberation. 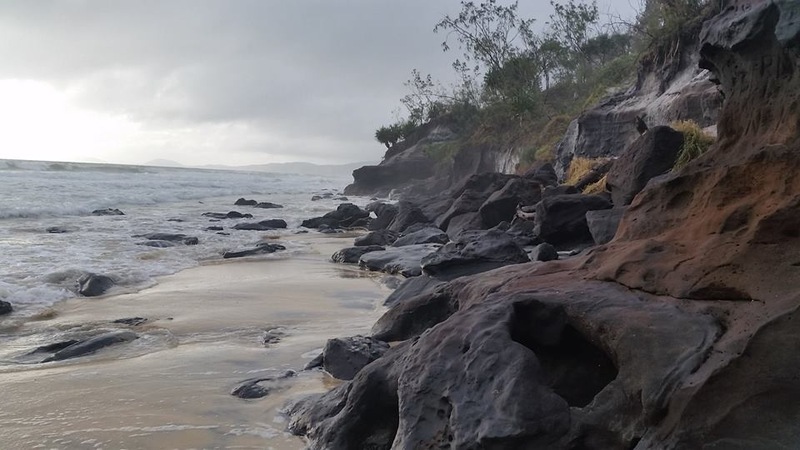 In early 2015 Tropical Cyclone Marcia managed to swallow 2 metres of sand off Rainbow Beach. Thankfully our world-class playground was returned to us within 2-3 weeks. Hema Maps are Australia’s leading map producers and distributors. When it comes to driving off the beaten track Hema Maps can be relied upon to provide reliable information.